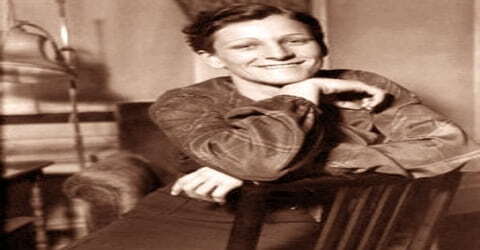 Babe Didrikson Zaharias – American athlete. Place of Birth: Port Arthur, Texas, U.S.
Place of Death: Galveston, Texas, U.S.
Babe Didrikson Zaharias, American sportswoman, one of the greatest athletes of the 20th century, performing in basketball, track and field, and later golf, was born on June 26, 1911, the sixth of seven children, in the coastal city of Port Arthur, Texas. Her mother, Hannah, and her father, Ole Didriksen, were immigrants from Norway. She developed a penchant for sports since her childhood days and she played various types of sports like tennis, volleyball, and swimming. In her childhood, she used to play baseball with neighborhood boys in Beaumont. It was this time when she hit five home runs and earned the nickname ‘Babe’. As an employee of Employers Casualty Company in Dallas, she led the team of Golden Cyclones during the AAU Basketball Championship in 1931. Babe won two gold medals in track and field at the 1932 Summer Olympics, before turning to professional golf and winning 10 LPGA major championships. She is widely regarded as one of the greatest female athletes of all time. She left her mark as a skilled golf player who became successful in 82 golf tournaments. She was the founder of Ladies Professional Golf Association. Babe was voted as the Woman Athlete of the Half-Century by the Associated Press. For her spectacular performance in various fields of sports, Associated Press voted her Female Athlete of the Year six times. This gifted athlete published her autobiography “This Life I’ve Led” in 1955. As the recipient of a number of prestigious awards, she was honored with Bob Jones Award after her death. 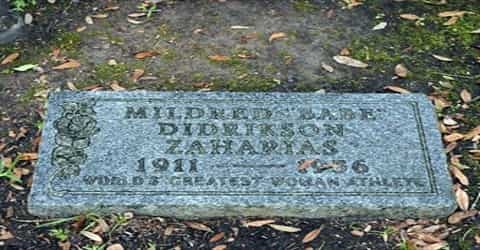 Babe Didrikson Zaharias, byname of Mildred Ella Zaharias, née Mildred Ella Didrikson, was born June 26, 1911, Port Arthur, Texas, U.S. She was the sixth of seven children of Ole Didrikson, a ship’s carpenter and cabinetmaker and Hannah Marie Olsen. Her father and mother were from Norway, where her mother had been an outstanding skier and skater. Her father was a ship’s carpenter and cabinetmaker. The family, who spelled their name Didriksen, moved to Beaumont, Texas, when Mildred was 3. In 1915, her family shifted to Beaumont, Texas. There she used to play baseball with local boys. Due to her remarkable performance in hitting home runs, she earned her nickname ‘Babe’, named after Babe Ruth, a renowned American baseball player. Babe studied at Beaumont High School. Due to her poor marks, she was forced to repeat the eighth grade. While attending this school, the school authority permitted her to play during her junior years. She was a singer and a harmonica player and recorded several songs on the Mercury Records label. Her biggest seller was “I Felt a Little Teardrop” with “Detour” on the flip side. Babe Didrikson married George Zaharias (1908–1984), a professional wrestler, in St. Louis, Missouri, on December 23, 1938. 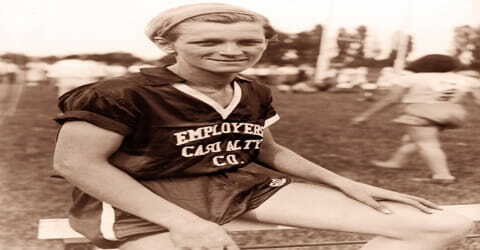 Thereafter, she was largely known as Babe Didrikson Zaharias or Babe Zaharias. The two met while playing golf. George Zaharias, a Greek American, was a native of Pueblo, Colorado. Called the “Crying Greek from Cripple Creek,” Zaharias also did some part-time acting, appearing in the 1952 movie Pat and Mike. They were rebuffed by authorities when they sought to adopt. They had no children. In 1953, Babe was under medical treatment for colon cancer for which she even had to have surgery. After the surgery, she continued playing golf and won several tournaments. 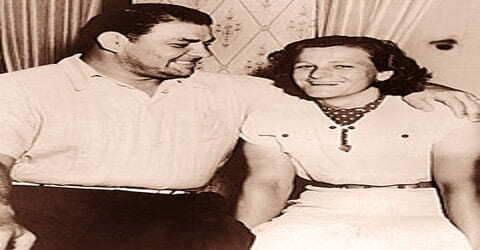 Together with her husband, she set up the Babe Zaharias Fund that provides financial support to cancer patients. In 1955, her cancer resurfaced and she had to undergo another surgery. She was a close friend of fellow golfer Betty Dodd. According to Susan Cayleff’s biography Babe, Dodd was quoted as saying, “I had such admiration for this fabulous person (Zaharias). I loved her. I would have done anything for her.” They met in a 1950 amateur golf tournament in Miami and became close almost immediately. Cayleff wrote, “As Didrikson’s marriage grew increasingly troubled, she spent more time with Dodd. The women toured together on the golf circuit, and eventually, Dodd moved in with Zaharias and Didrikson for the last six years of Didrikson’s life. They never used the word “lesbian” to describe their relationship, but there is little doubt that their relationship was both sexual and romantic. Without completing her studies, Babe shifted to Dallas to play basketball. She attracted the attention of Melvin J. McCombs, coach of one of the best girls’ basketball teams in the nation. In February 1930, McCombs secured a job for her with the Employers Casualty Company of Dallas, and she was soon a star player on its Golden Cyclones. She returned to Beaumont in June to graduate with her high school class. The Golden Cyclones won the national championship the next three years, and she was All-American forward for two of those years. This company used to sponsor the Golden Cyclones, a group of women athletes during 1930s. She led the Golden Cyclones during the Amateur Athletic Union Basketball championship in 1931. She achieved an important position in this team that became successful in the national championship for three consecutive years. She also played for her company in the 1932 AAU Championship that witnessed one of her best performances. During this tournament, she took part in eight events within 2 and a half hours. She achieved success in four events at that tournament. At that time she was contemplating taking part in the Olympics. Babe Didrikson won two gold medals and one silver medal for track and field in the 1932 Los Angeles Olympics. In the 80-meter hurdles, she equaled the world record of 11.8 seconds in her opening heat. In the final, she broke her record with an 11.7 clocking, taking gold. In the javelin, she also won gold with an Olympic record throw of 43.69 meters. In the high jump, she took silver with a world record-tying leap of 1.657 meters (5.44 ft). Fellow American Jean Shiley also jumped 1.657 meters, and the pair tied in a jump-off when the bar was raised to 1.67 meters (5.5 ft). Shiley was awarded the gold after Didrikson was ruled to have used an improper technique. From 1930 through 1932, Babe Didrikson was a member of the women’s All-America basketball team. During the same period, she also won eight events and tied in a ninth in national championship competition in track and field. In the 1932 Women’s Amateur Athletic Association (AAU), competing as a team by herself, Didrikson won six individual events and the team title, outscoring the 20-women runner-up team from the Illinois Athletic Club 30 points to 22. At the 1932 Olympic Games in Los Angeles she won the 80-meter hurdles and the javelin throw and was deprived of a third gold medal in the high jump only because she had used the then-unorthodox Western roll to achieve the highest jump; she was awarded the silver medal instead. She also excelled in baseball and softball, swimming, figure skating, billiards, and even football. Babe Didrikson also tried her hand at billiards and long-distance swimming. She even went on a tour in the rural areas with a basketball team. Later, she went on a tour across the country with the male baseball team. She started playing golf in 1933. She won the Texas Women’s Amateur Championship in 1935. In 1945, she took part in three men’s PGA tournaments. She successfully played seventeen amateur golf tournaments. In 1938 Babe Didrikson married George Zaharias, a professional wrestler. She began playing golf casually in 1932, but from 1934 she played that game exclusively. Restored to amateur status after some years as a professional, she won the U.S. Women’s Amateur tournament in 1946. The next year she won 17 straight golf championships, including the British Ladies Amateur, of which she was the first American holder. As a professional again from 1948, she won the U.S. Women’s Open in that year and in 1950. From 1948 through 1951 she was the leading money winner among woman golfers. Diagnosed with cancer, she underwent surgery in 1953, then went on to win the U.S. Open again in 1954. Didrikson began playing golf in 1931 or 1932. According to Gallico, in 1932, in her 11th game of golf, she drove 260 yards from the first tee and played the second nine in 43. She herself stated that she entered her first golf tournament in the fall of 1934. Although she did not win, she captured the qualifying round with a 77. In April 1935, in the Texas State Women’s Championship, she carded a birdie on the par-5 31st hole, to win the tournament two-up. By 1935, Didrikson began to play golf, a latecomer to the sport in which she became best known. 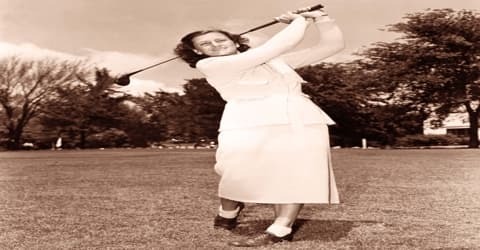 Shortly thereafter, she was denied amateur status, and so, in January 1938, she competed in the Los Angeles Open, a PGA (Professional Golfers’ Association) tournament. No other woman competed against men in this tournament until Annika Sörenstam, Suzy Whaley, Michelle Wie and Brittany Lincicome almost six decades later. She shot 81 and 84 and missed the cut. In the tournament, she was teamed with George Zaharias. They were married eleven months later, and settled in Tampa, Florida, on the premises of a golf course that they purchased in 1951. 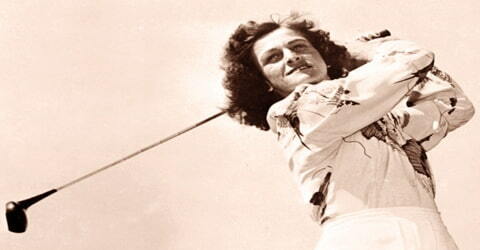 Urged by her husband, Babe applied for reinstatement as an amateur golfer in 1941 and was reinstated in January 1943. Utilizing her tremendous powers of concentration, her almost unlimited self-confidence, and her patience, she began to take up golf seriously. She would drive as many as 1,000 balls a day, take lessons for five or six hours, and play until her hands were blistered and bleeding. In 1947, Babe Didrikson Zaharias became the first American woman to win the British Ladies’ Amateur Championship, at Gullane, Scotland. On one hole she stroked a drive so far that a spectator whispered, “She must be Superman’s sister.” That August she announced that she was turning professional. For the next six years, she dominated women’s golf. Zaharias won a tournament named after her, the Babe Zaharias Open of her hometown of Beaumont, Texas. She won the 1947 Titleholders Championship and the 1948 U.S. Women’s Open for her fourth and fifth major championships. She won 17 straight women’s amateur victories, a feat never equaled by anyone. By 1950, she had won every golf title available. Totaling both her amateur and professional victories, Zaharias won a total of 82 golf tournaments. Along with golfer Patty Berg, she founded the Ladies Professional Golf Association in 1949. The aim of this association was to encourage professional women golfers. Patty acted as its president for the first year. She successfully won five golf tournaments which also included the United States Women’s Open in 1954. Later, she participated in Tam O’Shanter All- American golf tournament. On March 20, 1934, Didrikson pitched one inning in a major league baseball spring training exhibition game for the Philadelphia Athletics against the Brooklyn Dodgers. She gave up a walk and no hits. Two days later, on March 22, 1934, Didrikson pitched the first inning of a major league baseball exhibition game for the St. Louis Cardinals against the Boston Red Sox. It was reported that “Under the tutelage of Burleigh Grimes, Dizzy Dean, and others she has learned to stand on the rubber, wind up like a big leaguer and throw a rather fair curve.” The Red Sox scored three runs against Didrikson in the inning before she got Boston third baseman Bucky Walters to fly out to future Hall of Famer Joe Medwick in left field to end the inning. Didrikson was relieved at the start of the second inning by Cardinal pitcher Bill Hallahan. 400 fans were in attendance. Three days later, on March 25, 1934, she played for the New Orleans Pelicans against the Cleveland Indians, pitching two scoreless innings and lining out in her only plate appearance. Didrikson is still recognized as the world record holder for the farthest baseball throw by a woman. This celebrated athlete was a talented seamstress. Besides designing her golf outfits, she was the winner of South Texas State Fair in Beaumont for her expertise in sewing. 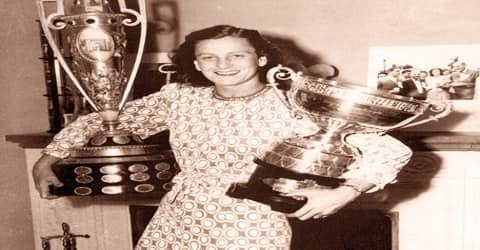 Babe Didrikson Zaharias was named the 10th Greatest North American Athlete of the 20th Century by ESPN, and the 9th Greatest Athlete of the 20th Century by the Associated Press. Babe Didrikson Zaharias had a cancer operation in April 1953, and it was feared she would never be able to return to competition. Three and a half months later, though, she played in competition. The next year she won the United States Women’s Open by twelve strokes. In 1955 she had a second cancer operation. On September 27, 1956, Zaharias died of her illness at the age of forty-five at the John Sealy Hospital in Galveston, Texas. At the time of her death, she was still a top-ranked female golfer. She and her husband had earlier established the Babe Zaharias Fund to support cancer clinics. She is buried at Forest Lawn Cemetery in her hometown of Beaumont, Texas. 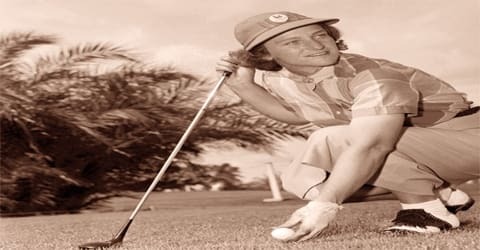 Babe Didrikson Zaharias was the greatest woman golfer of all time, the winner of seventeen successive golf tournaments in 1946-1947, and of 82 tournaments between 1933 and 1953. The Associated Press voted her “Woman of the Year” in 1936, 1945, 1947, 1950, and 1954. In 1950 the AP acclaimed her the “Woman Athlete of the Half Century.” The skinny, shingle-headed teenager, a shy and socially immature girl who could win at sports but usually antagonized her fellow competitors, became a poised, well-dressed, graceful and popular champion the darling of the galleries whose drives whistled down the fairways and whose comments won the hearts of the spectators. She has a museum dedicated to her in Beaumont, Texas, the Babe Didrikson Zaharias Museum. Several golf courses are named after her. 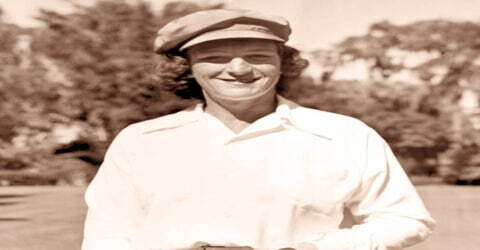 A Tampa, Florida golf course that she and her husband owned, the Babe Zaharias Golf Course, was given landmark status.